The picture is taken in The Nook, they are celebrations for Queen Victoria’s Diamond Jubilee in 1897. 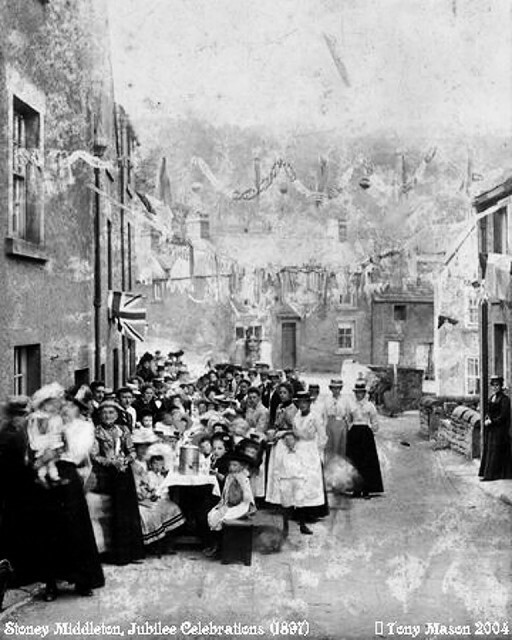 The little old lady 2nd left, next to the woman holding a child in the foreground, is Mary Hallam, wife of Peter John Hallam, née Goddard, and formerly wife of Joseph Hancock. This later snippet was by courtesy of the late Muriel Onac, né Hallam, who also had a copy of the photograph. Photograph provided via Janet Kirk, from Kevin Mason (original belongs to Geoff).